This book offers an introduction to existing and soon to be released satellite communication technologies and services. It covers how satellite systems are changing, growth in key satellite markets, key technologies that are used in satellite systems, commercial satellite systems, and provides information on the leading services and their costs for satellite communication. This Figure shows a LEO satellite system. 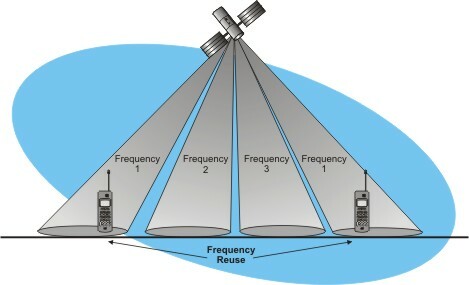 In this diagram, a portable satellite telephone is communicating with a landline telephone. The satellite telephone communicates with the closest LEO satellite. Because LEO satellites fly very close to the surface of the earth, they go across the visible horizon in approximately 10 minutes in reference to a mobile satellite customer's location. When the first satellite moves out to the horizon, another LEO satellite becomes available to continue the call. However, robust network communications need to be in place to maintain calls (especially data transmission) within this period. Some systems will use satellite diversity to allow talking through more than one satellite at a time, avoiding call "dropouts" from signal blockage. This figure shows a global positioning satellite (GPS) system. This diagram shows how a GPS receive receives and compares the signals from orbiting GPS satellites to determine its geographic position. Using the precise timing signal based on a very accurate clock, the GPS receiver compares these signals from 3 or 4 satellites. Each satellite transmits its exact location along with a timed reference signal. The GPS receiver can use these signals to determine its distance from each of the satellites. Once the position and distance of each satellite is known, the GPS receiver can calculate the position where all these distances cross at the same point. This is the location. This information can be displayed in latitude and longitude form or a computer device can use this information to display the position on a map on a computer display. This figure shows a satellite system that uses spatial division multiple access (SDMA) technology. In this example, a single satellite contains several directional antennas. Some of these antennas use the same frequency. This allows a single satellite to simultaneously communicate to two different satellite receivers that operate on the same frequency. Usually beams that are separated by more than two or three half-power beamwidths can use the same frequencies, as shown in the figure. Ben Levitan, is an engineer and an expert on new and developing wireless standards for Satellite and Cellular Systems including ANSI-41, GSM, and 3rd Generation systems. Mr. Levitan is an active participant for the US and international development of ANSI-41, GSM, 802.11, All-IP (3G Standards), Interstandard Roaming and FCC and US Government mandated features and requirements. Mr. Levitan has represented COMSAT, Intelsat and Aeronautical Radio, Inc. in the development of satellite standards and was a member of the United States Delegations to the United Nation's International Telecommunications Union conferences for worldwide standardization of telecommunications for eight years. Mr. Levitan is active in the development of the design of standards for the first, second and third generation of standards for wireless and cellular system, representing the engineering and business interests of GTE, Verizon International, TSI and other clients at the industry forums for development of cellular systems standards. Mr. Levitan expertise includes international roaming for cellular systems and government and FCC mandated features such as the new required Wiretap standards (CALEA), Local Number Portability and 911 emergency standards for the cellular industry. Mr. Levitan is a frequent speaker at wireless industry forums and conferences and is the author of two technical industry websites, www.GSMhandbook.com and www.IETFhandbook.com. Mr. Harte is the president of Althos, an expert information provider covering the communications industry. He has over 29 years of technology analysis, development, implementation, and business management experience. Mr. Harte has worked for leading companies including Ericsson/General Electric, Audiovox/Toshiba and Westinghouse and consulted for hundreds of other companies. Mr. Harte continually researches, analyzes, and tests new communication technologies, applications, and services. He has authored over 30 books on telecommunications technologies on topics including Wireless Mobile, Data Communications, VoIP, Broadband, Prepaid Services, and Communications Billing. Mr. Harte�s holds many degrees and certificates include an Executive MBA from Wake Forest University (1995) and a BSET from the University of the State of New York, (1990). Mr. Harte can be contacted at LHarte@tvdictionary.com. In 2003, the satellite industry was a high-growth business that achieved over $83 billion in annual revenue. This book offers an introduction to existing and soon to be released satellite communication technologies and services. It covers how satellite systems are changing, growth in key satellite markets, key technologies that are used in satellite systems, commercial satellite systems, and provides information on the leading services and their costs for satellite communication. Each type of satellite system and its technologies have unique advantages and limitations, which offer important economic and technical choices for managers, salespeople, technicians, and others involved with satellite equipment and systems. This Introduction to Satellites book provides a basic understanding of the major satellite systems, technologies, issues, and options available. This book explains the different types of satellite communication systems and technologies. Covered are the basic types of satellite systems including GEO, MEO, LEO, and elliptical orbit satellites. Described are public and private satellite systems including DBS, DSS, and very small aperture terminals (VSAT) along with the important characteristics of these satellite systems.